Freshly picked strawberries are just one of the many simple joys you experience when growing your own vegetables at home. Besides having the satisfaction of knowing your helped create these bright red little fruits all on your own, you can also rest easy knowing they are free of pesticides, are GMO free or even organic. 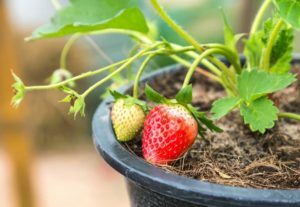 While growing your own strawberries at home in a traditional garden isn’t overly hard, growing strawberries in pots makes harvesting these delicious fruits even easier, and allows those with very limited space to grow fresh berries at home. Containers and pots are perfectly suited to the small size and fast growing nature of strawberries. The pots are easily moved to follow the sun, drain well (strawberries don’t like wet roots), and can easily be lifted of the ground to reduce the chance of slugs or even diseases, from ruining your hard work. Growing strawberries in pots or other containers also allows you to easily move them indoors or cover them with a row cover, if you are expecting an early frost or unseasonably cool weather. What kind of pots or container do I need to grow strawberries? Any regular flower pot will do. Planting strawberries in hanging pots though allows for an easy harvest as the fruit tend to dangle over the side. This also produces a neat effect which can be exploited by planting strawberries in vertical planters or towers. Since strawberry plants have pretty shallow root systems, you don’t need an overly large pot or planter. Generally planters 8 inches in diameter and at least 6 inches deep is are the perfect size for one strawberry plant. It’s better to choose a larger pot then a container that’s to small. The smaller the pot or container the more you will need to water it, and cramping the plants can effect their health. If you want to plant multiple plants in one container, you’ll need a larger pot to allow for 8 or 10 inches between the plants. Planting strawberry seedlings in pots. Growing strawberries in pots is as easy if not easier then if you where to grow them in a garden setting. 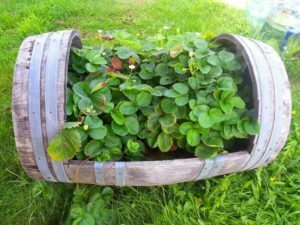 There are two ways to grow strawberries in pots. You can start with bare root plants, or seedlings purchased at a nursery. As seedlings will establish faster and produce a harvest quicker, I will focus on that process here. You can also grow strawberry seedlings from seed, or learn how to plant bare root plants. Select a pot or planter at least 8 inches in diameter and 6 inches deep. Fill your container with a mixture of multipurpose potting soil and some compost, then create a hole in the middle large enough to accommodate the entire potted strawberry plant. Gently wiggle the strawberry seedling out of it’s nursery grown container, and firmly place it in the hole of the new pot/planter. Make sure the root crown,(where the leaf stems come out of) is right at or very slightly above the soil surface level. Fill in around the plant with more potting soil and firmly pack in place. Water the re-planted strawberry seedlings, taking care not to get water on the leaves. Gently lift them and water around the root crown to avoid fungal diseases. Allow the potted strawberries to receive at least 6 hours of sunlight a day. A tried and true strawberry variety ideal for growing in pots is the ‘Albion Strawberry’ which is available online through Vesey’s Seeds. Once potted, the strawberry plants do need a certain amount of care and attention to be vigorous and ensure a successful harvest of berries. Feeding the strawberry plants is important especially if you did not add some compost into the potting soil when originally potting the plants. In the first year, this may not be a huge deal, as good quality potting soil usually has nutrients in it. But in the second and even Third year, you definitely need to fertilize. Use a organic phosphorous rich fertilizer that can easily be added to the soil without touching the leaves. I personally use liquid Neptunes Harvest Fertilizer which can easily be added to the water while watering. It’s also important to regularly water your potted strawberry plants. How often you need to water them depends on many things, such as the humidity, temperature, and maturity of the plants. A quick way to tel if you need to water is to simply stick a finger in the soil. If the top 1 inch is dry, it’s time to water. Make sure the container has a hole in the bottom to allow drainage! Depending on the variety of strawberry planted, you’ll need to regularly pick the ripe fruit! Ever bearing strawberries will provide a few berries every day throughout the summer, while June bearing varieties will have one large harvest all at once! Since strawberry plants are perennial, (the come back year after year) it’s important to know how to over-winter the potted plants. If you have been growing strawberry plants in a traditional garden setting, you would over winter the plants by cutting down the leaves in late fall (once they turn yellow), and then covering the plants with up to 8 inches of straw, leaves or compost as insulation. The same principle applies to over wintering potted strawberry plants. You want to protect the roots from frost and freezing temperatures with some insulation. 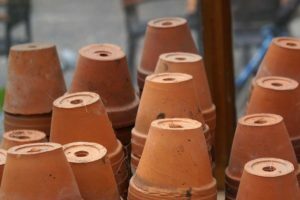 The easiest way to do this is to bring the pots or containers into a cold yet protected space, such as an un-heated garage, garden shed, or greenhouse. Since I have neither of these, I create a ‘nest’ of thick straw which I sink the pots into right to the rim. You want at least 8 inches of ‘insulation’ on all sides, after which I also cover the top with more straw. In the spring once the last frost has passed, I simply remove the straw (it gets used as mulch during the year), water the plants a little to kick start them, and let them wake up on their own. Comment below if you have or are thinking about growing strawberries in pots! If you do, take a picture and tag me on Facebook & Instagram: @earthfoodandfire .